These days less is more and growing in popularity is to pair down ones closet; to have a capsule closet of sorts. But to actually do so you would need varying pieces that can play well with others, in other words, great basics. This is where Kit & Ace comes in, the brand founded by the mother and son duo Shannon and JJ Wilson, wife and son of the man who founded Lululemon. So there’s no doubt this family knew about luxury work out apparel, and wanted to up the notch to a more sophisticated comfortable attire full of their branded Technical Cashmere. Kit & Ace recently opened up a beautiful store in Rice Village to go and experience each piece for yourself. With the holiday season literally upon us here are a few of our favorites for the guys and the ladies. Got plans next Tuesday? 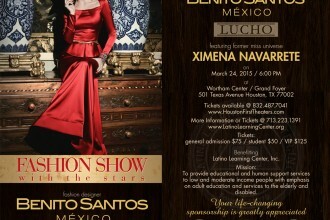 Fashion with the Stars is featuring fashion designer Benito Santos, a famous designer from Mexico, along with local shop Lucho….